How to draft a House Cleaning? An easy way to start completing your document is to download this House Cleaning template now! Creating a house cleaning schedule can help you keep peace and order in your home, most of the time, as long as you can stick to it. The sticking to it part is a lot easier said than done though. No More Frantic Cleaning – Your house will be reasonably clean all the time if you stick to your cleaning schedule. Share Responsibilities – I usually end up doing all the cleaning in my house simply because I know what has been done and what needs to be done. If there is a posted schedule, people can be assigned tasks or pick up tasks that haven’t been done yet. Less Stress – When my house isn’t clean, I always feel as though I have something I should be doing, which makes it hard to relax. If I follow a schedule, I can relax once I have done everything on my checklist for the day. Greater Efficiency – If you don’t have your tasks planned out, time is wasted figuring out what to do. With a schedule, everything is mapped out for you to get started. Not only that, your schedule can be tailored to your family members’ strengths and availability. Fight Procrastination – I procrastinate cleaning for a variety of reasons, but being organized and having a cleaning schedule is one way for me to stop and overcome procrastination. We provide this standardized House Cleaning template with text and formatting as a starting point to help you organize the household. This ready-made household schedule can help you to save time and to focus on the topics that really matter! 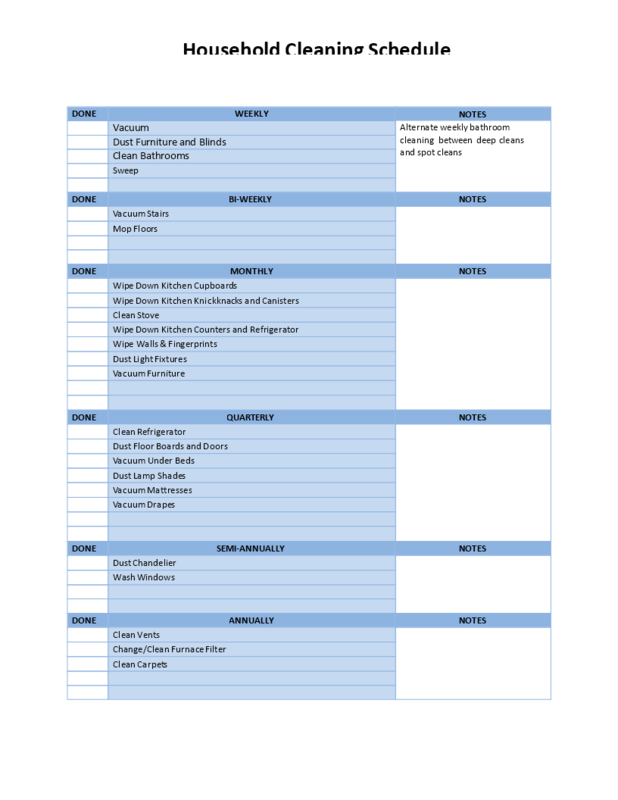 Using this schedule template guarantees you will save time and efforts! It comes in Microsoft Office format, is ready to be tailored to your personal needs. Completing your document has never been easier! Download this House Cleaning template now for your own benefit!